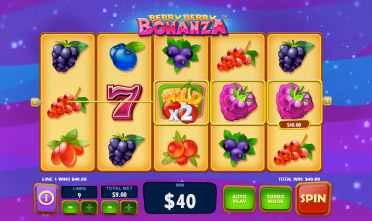 BERRY BERRY BONANZA – A NEW TWO-WAY PAY CLASSIC! A classic pub-style video slot fruit machine where the wild symbol doubles all wins. A simple and enjoyable 9-line game, this TWO-WAY pay slot pays from left to right and, right to left adding more excitement to your play. Filled with fruit symbols on the reels such as strawberries, berries, currants, grapes, raspberries, blueberries, wild (cherry) and a pink 7 (scatter). The strawberry is the most valuable symbol, five of them at the maximum bet pays 5,000 coins, but get a 2X and you will win 10,000 coins!. $100.00 Bonus! On Sunday from 00:00GMT until 23:59 GMT, all members on their deposit of just $/£/€30 or more will receive a 100% bonus up to 100.00. $133 BIG TUESDAY! From 00:00GMT until 23:59 GMT, all members on their deposit of $/£/€30 or more will receive a 133% bonus up to $133.00 bonus. Kicked-Up Thursdays! NEW! From 00:00GMT until 23:59 GMT, all members are invited to receive ONE of four bonuses based on your deposit amount starting at just $/£/€ 30 or more.